100 Spots for the Economic & Interracial Justice Webinar, Register Now! 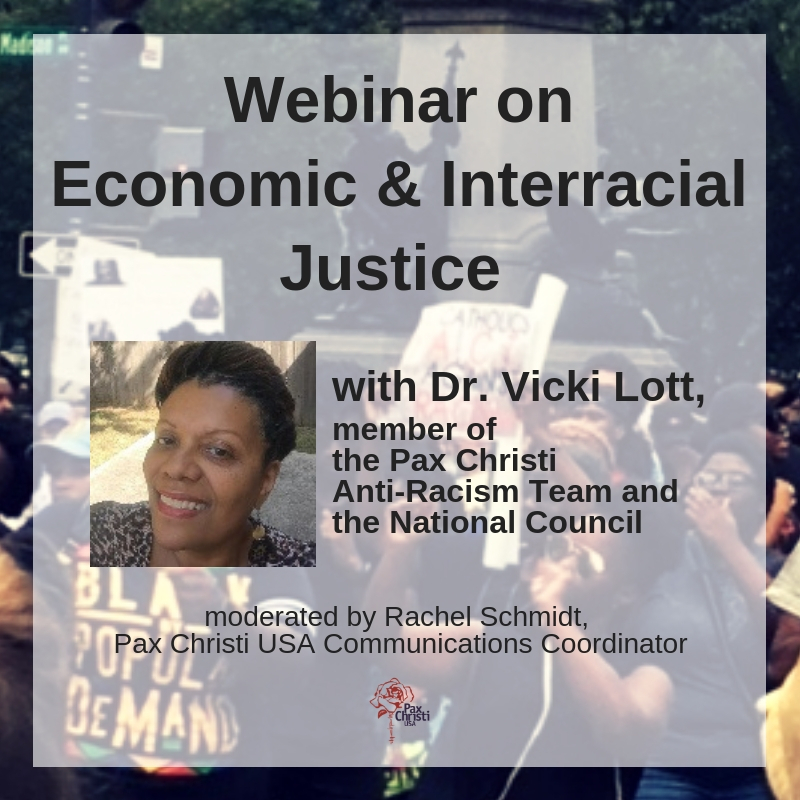 Dr. Vicki Lott, member of the Pax Christi Anti-Racism Team and the National Council, is leading a webinar on “Economic & Interracial Justice.” Dr. Lott will discuss the intersection of economic and racial justice by looking at how the United States became wealthy as a direct result of racism. Futhermore, she will illustrate how the U.S. has continued this racist legacy through policy and deep denial and then delve into the hope the Gospel and Catholic Social Teaching offers to overcome the deep division and hatred that racism has created. Dr. Lott is a trained facilitator of Racial Sobriety with Father Clarence Williams and is also a Racial Equity Consultant with Joyce James Consulting. Vicki is retired from a 32-year career in higher education administration at five Historically Black Colleges and Universities (HBCUs). She is passionate about addressing institutional racism in all of our systems. There are 100 spots available for this webinar. Register now! I would love to hear this webinar, but have a commitment on Thursday mornings here in El Paso. Will there be a taped version available online later? Thank you. Yes! The recorded version will be available online later. Hi there, We will send out the recorded version a few days after the live version is held. Make sure you’re on our email list so we can email it to you: https://visitor.r20.constantcontact.com/manage/optin?v=001lmD1-4TnS4YHKJ73_lJcXkR85QxCe0Qz.